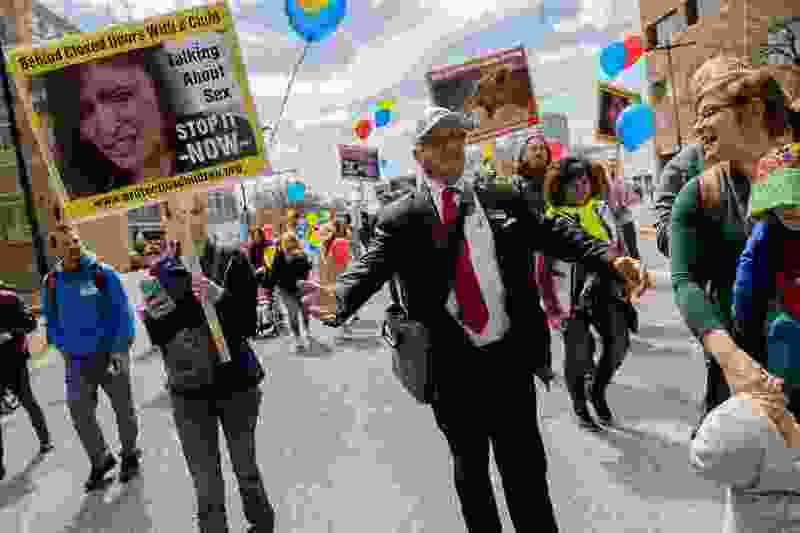 (Trent Nelson | The Salt Lake Tribune) Sam Young leads a march to the LDS Church Office Building in Salt Lake City to request that the faith's leaders put an end to bishops meeting one on one with youths for interviews. Friday, March 30, 2018. Sam Young has decided to let the world find out at the same time he does whether he is being excommunicated from The Church of Jesus Christ of Latter-day Saints. The former bishop — who has been campaigning to get the Utah-based faith to end all one-on-one interviews between Mormon clergy and youths, sessions that sometimes include sexually explicit questions — has scheduled a news conference for noon Sunday, across from the church’s iconic Salt Lake Temple, to reveal his membership status. On Sunday, Young appeared before his lay leaders in Houston for a “disciplinary council.” Opposing church leaders accused him of crossing a line and urging other members to do the same. In his defense, the Texas businessman noted that he is against some church policies, not church policymakers. He urged his local lay leaders to “be men of God” and stand up against these youth interviews. To further his cause, Young previously formed a group, Protect LDS Children, launched an online petition and led a march to church headquarters to deliver tens of thousands of supportive signatures. He also staged a three-week hunger strike. Young said he expects to be excommunicated but explained on The Salt Lake Tribune’s "Mormon Land” podcast this week that hopes to retain his membership and work for reform from within the church. Sunday’s news conference is set for South Temple across the street from Temple Square. In March, the 16 million-member faith updated its policies, adding the option of an interviewee to have another adult present. Young insists that that approach doesn’t go far enough, and that few members, especially teenagers and children, would afford themselves to that possibility. Church leaders have also stated that bishops are taught to avoid graphic detail during interviews and to “not be unnecessarily probing or invasive in their questions.” But Young points to cases in which such grillings still take place.